A few weeks ago I was at my parents place. It’s a fairly new home, built in 2009 in a quiet community with a small back yard. They have a couple raised garden boxes where my mother grows some vegetables, a deck to sit with patio chairs, a nice flower bed area and a wooden fence that is falling apart. When the house was built and before Direct Fencing Supply existed, my parents chose to stop by a national building centre to pick up some wooden panel fencing. Wooden panel fencing is typically pre-built and mass produced at a factory, reducing installation time for the consumer. These panels look fairly attractive in the store and have numerous different styles to choose from, including cedar and pressure treated pine. No one buys a fence only to replace it less than two short years later, but that is what my parents are facing. 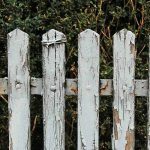 Through regular temperatures and Saskatchewan weather, this wooden fence should have lasted 15 years, possibly longer with an application of stain every couple years. They have no pets, children at home or anything that would reduce the life of the fence other than it just doing what a fence does: stand. 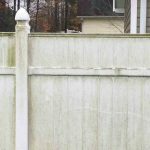 Sagging is a common problem among wooden panel fencing and low grade vinyl fencing. DFS Premium Vinyl Fencing has an aluminum insert in the bottom rail for strength and durability, helping to prevent sagging. An aluminum insert is also available for the top rail. Have you or someone you know ever installed wooden panel fencing? If so, we’d like to hear about it. Comment below.